Item # 306312 Stash Points: 3,199 (?) This is the number of points you get in The Zumiez Stash for purchasing this item. Stash points are redeemable for exclusive rewards only available to Zumiez Stash members. To redeem your points check out the rewards catalog on thestash.zumiez.com. 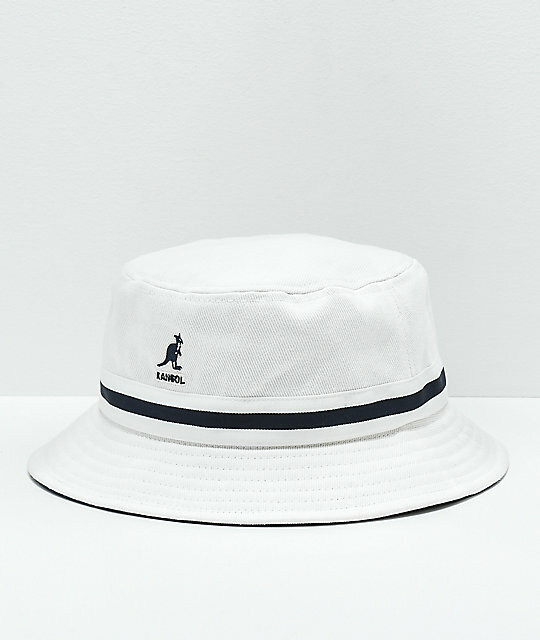 Whether you are chilling poolside, or you are looking for a streetwear inspired look, the Stripe Lahinch White Bucket Hat from Kangol will have you covered. The Lahinch bucket hat is cut from a white, 100% cotton, and features a two toned band that wraps around the brim. A hint of color is provided thanks to the navy colored brim and taped seams on the inside of the hat. Protect yourself from the sun, while looking fly, in the Stripe Lahinch White Bucket Hat from Kangol. Stripe Lahinch White Bucket Hat from Kangol. White cotton construction with navy striped band. Embroidered Kangol logo on the front .